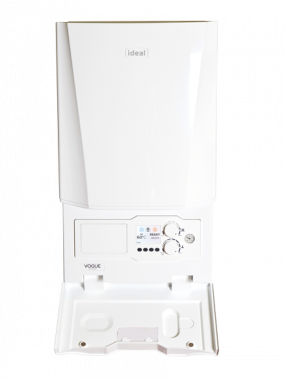 This is a condensing system gas boiler made and manufactured by Ideal. The Vogue Gen2 is a wall mounted unit with an efficiency rating of 89.4% making it B rated. It has an output rating of 32kW which makes the unit perfectly suited for a medium sized home that doesn't have an excessive need for hot water. As a system boiler it will directly heat your central heating system and produce hot water for a storage cylinder. Most of the important parts of the hot water and heating system, such as the pump and expansion vessel, are built in on a system boiler making it quicker and cleaner to install. It also means you get a faster response to demand for heating and hot water. In addition, you don't need to have a feed and expansion tank in the loft which frees up a lot of space in your home. This boiler has been manufactured with premium components including an easy to read pressure gauge, uniform control opening across all ideal products, quick installation cool door technology, stylish aesthetics with full size door complete with damped opening up to 7:1 modulation and a stainless steel heat exchanger. All these components result in a highly reliable boiler. With a low lift weight of 30.7kg it is up to 2.6kg lighter than any previous models. The compact design enables a quick and easy installation that will save you both time and money. It also features a backlit 3.5 LCD full colour display and multifunctional buttons improving usability, control and enabling you to achieve the highest levels of efficiency. This boiler features a standard 8 years warranty to give you peace of mind that you have purchased the right boiler that won't let you down.